More than 60% of Australian adults are overweight or obese and the figure is steadily rising. Being more than your ideal weight increases your risk of many weight related chronic diseases e.g. cardiovascular disease, diabetes, high blood pressure, metabolic syndrome, stroke, some cancers and sleep apnoea. For adults, calculating your BMI (Body Mass Index) is a quick way to check weight status e.g. to determine if you have a healthy weight for your height. The following calculator can be used by most Australian adults* as a guide to assess weight status. Enter your height and weight, then click calculate. (Choose: ‘English’ if you are using feet, inches and pounds or ‘Metric’ if you are using centimetres and kilograms). * These BMI values apply only to adults aged 18 – 64 years. These BMI values do not apply to some populations e.g. older people, pregnant women, adolescents, children, some ethnic groups (including people of Asian, Japanese, Aboriginal, Torres Strait Islander and Maori descent) and people with a lot of muscle (athletes). 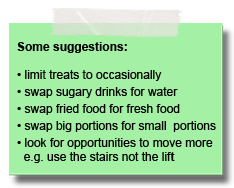 If you fall outside the healthy weight range, speak to your doctor or dietitian. 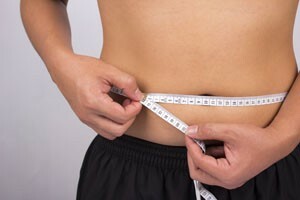 Your waist measurement is considered better then BMI for estimating your body fat, especially your abdominal fat and your likelihood of developing weight related chronic diseases. Measure directly against your skin. Find the bottom of your ribs and the top of your hip bone. Place the tape measure around your waist midway between these points. This will be roughly in-line with your belly button. Have the tape measure fitting snuggly, but not compressing the skin. Take the measurement and see the table below. *The waist measurements above are recommended for adult Caucasian men and Caucasian and Asian women. These BMI values do not apply to some populations e.g. Asian men, medical conditions where there is distension of the abdomen, pregnant women, adolescents and children. If you have just calculated your BMI and measured your waist and found you are overweight or obese and your health risk is increased or high, then you are not alone. More than 60% of Australian adults are in the same boat as you. It is easier than ever before to gain weight! Our current western lifestyle has readily available foods and drinks, which are high in kilojoules (energy), saturated fat, added salt and sugars. They are also affordable, tasty and the large portion sizes – all encourage over-eating. This is compounded by the fact that we are also less active at work and in our spare time. Our body is also sabotaging us! As we age our metabolism (ability to burn kilojoules) decreases. This is due to loss of muscle; muscles burn kilojoules. This means to maintain your weight, that is to not gain weight, you are going to have to eat less kilojoules as you get older (or exercise a lot to maintain muscle mass). Failure to do this results in ‘middle age spread’! Your weight is a balancing act, but the equation is simple: If you eat more kilojoules (energy) than your body needs, you gain weight. If you eat fewer kilojoules (energy) than your body needs, you lose weight. 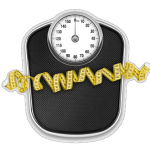 Even just a small excess kilojoule intake on a regular basis can explain weight gain e.g. if you consume 400 kilojoules (equivalent to 1 biscuit or 100 calories) above your daily energy requirements, then after a year you will have gained 4 kilograms. The good news is by making small healthy changes (think lifestyle change, not short-term diet) to your eating and physical activity habits you can lose excess weight and reduce or even reverse your risk of weight related chronic diseases. Even a modest weight loss, such as 5 to 10 percent of your total body weight, is likely to produce health benefits, such as improvements in cholesterol, blood pressure and blood glucose. The Australian Dietary Guidelines includes information about how much and what types of food you need to eat to maintain a healthy weight.